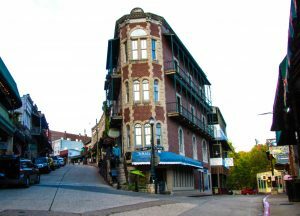 When visiting Eureka Springs, you’ll soon discover that your biggest worry is deciding what to do next! You don’t have to travel far from the bed and breakfast to discover an abundance of things to do. Use this page as inspiration for Eureka Springs vacation ideas. Spend a relaxing day strolling the downtown, browsing antique shops and galleries, sampling the great food at local restaurants and eateries, or choose to take in a show or head out for an adventure in the great outdoors. There truly is something for everyone in Eureka Springs. 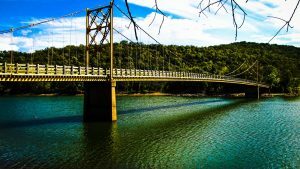 To help you plan your ideal visit to Eureka Springs, we have listed below places and activities either we or our guests have enjoyed. 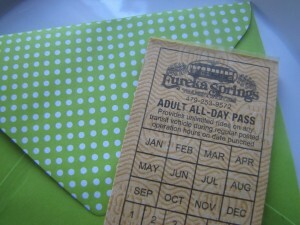 We also have trolley passes! For a more complete list of area attractions and activities, please visit the Eureka Springs Chamber of Commerce and the Eureka Springs Tourist Bureau websites. Blue Springs is an area favorite for weddings. And, who would have thought that the calm looking spring puts out 38 million gallons of water a day. 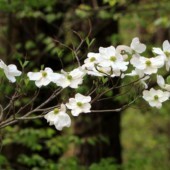 Besides the spring, stroll through the gardens, feed the trout and enjoy all the sights and smells that Blue Springs has to offer. See lions, tigers and bears (oh my! ), plus cougars, panthers, monkeys, and many other animals that Turpentine Creek has rescued. They have some animals in cages you can see as well as a tour out back where the animals have their own area to roam. They post the stories behind each of the animals they have rescued which makes the visit a little more personal. A short drive to historical War Eagle Mill, a water-powered grist mill on the War Eagle River, where the daily grind is fresh wholegrain cornmeal, flours, mixes and cereals. There is a gift shop and the Bean Palace Restaurant. If you go to War Eagle Cavern then make sure you also stop here. Nestled in a woodland setting, Thorncrown Chapel rises forty-eight feet into the Ozark sky. We love to go and just sit as it is such a peaceful place to be with its magnificent wooden structure that contains 425 windows and over 6,000 square feet of glass. Designed by E. Fay Jones, an apprentice of Frank Lloyd Wright, Thorncrown has won numerous architectural awards and has been featured on television programs and in national magazines. Everyone should see this at least once in their life. It’s an outdoor spectacle with hundreds of actors and animals depicting the last days of Jesus. Celebrating over 50 years with lots to do on property prior to the performance. Open year-round with the Play operating May – October. This live stage show has been a Eureka Springs favorite for years. Intrigue Theater takes you back to the Victorian age to experience an evening of Mystery & Intrigue performed by an Illusionist & a Medium Featuring Special Guests from the other side! Built in 1928 The Aud has served the City of Eureka Springs and the Ozarks for centuries. Check out their lineup for concerts and events while in town. For a small village museum there is a lot of history packed into this building. 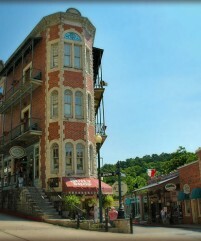 For those visiting Eureka Springs for its history, this is the place to start. While the tour is long, you do get some excellent history about the Crescent Hotel’s past, both historically and ghostly. If you are into ghosts or just want to learn some interesting Eureka Springs history, this is the tour for you! 3 Haunted Offerings available year round. This attraction is an area favorite. It’s not a castle or an architecturally significant structure. 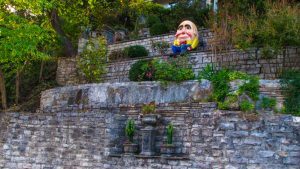 It’s just one of the most interesting places here in Eureka Springs. If you go we think you’ll also say, “That’s interesting!” Don’t miss the butterfly wall, it’s an incredible collage. 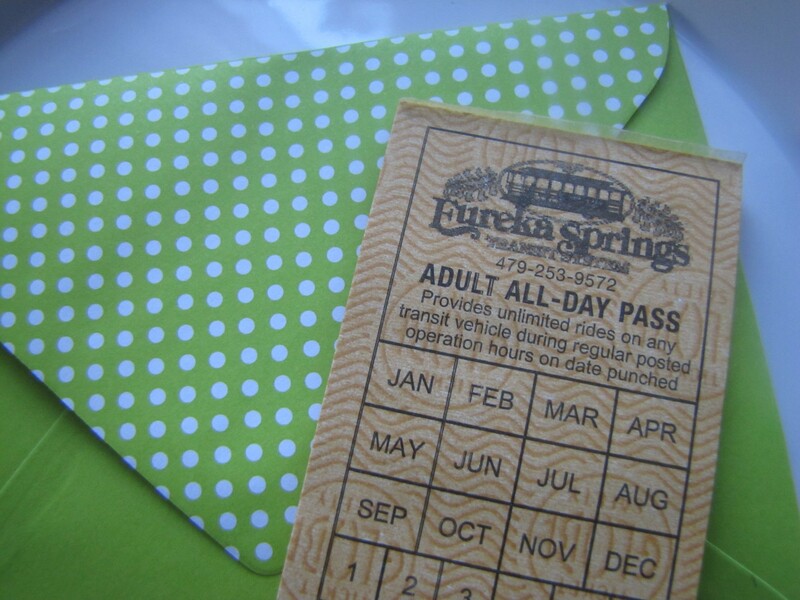 If you are looking for a quick tour of Eureka Springs, consider taking the tram tour. The tram tours are approximately 90 minutes in length and are fully narrated by a local tour guide that knows Eureka Springs inside out and upside down! If you have questions, they will be happy to answer them! The schedule varies with the seasons, so checkout their website for the latest information. Fresh Harvest – one of the largest, freshest selections of Ultra Premium Extra Virgin Olive Oils, plus fused and infused Olive Oils and aged balsamic vinegars on tap in the USA. Take a tasting tour, offered daily! Melonlight Dance & Yoga – Ready to try something new? Private or Group lessons available in Ballroom, Latin, Swing, Tango, Country or Yoga. Escape Room 13 – A One Hour Adventure Awaits. An immersive live action story with secret messages, hidden passages, and fun that puts you in the story. Uniquely Eureka Springs! ESSA Eureka Springs School of Art – ESSA began in 1998, offering local artists workshops throughout the year. ESSA has grown into a 55-acre campus with seven teaching studios located in the beautiful Ozark Mountains of Northwest Arkansas. Home to the largest hand-laid, limestone dam in the nation. 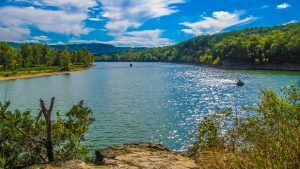 Lake Leatherwood City Park offers 1,600 acres of Ozark Mountain countryside with an 85-acre spring-fed lake, hiking, picnicking, walking trails, camping, cabins, and a small marina for boating, canoes, and paddle boats. Open year-round. Provides canoe, kayak, shuttles, and guide services. Completed in 1966 and nestled high in the Ozark Mountains near Eureka Springs, AR. The 28,370-acre lake is the first of the impoundments created in Arkansas and Missouri along the lengthy White River system. Its’ 487 miles of shoreline offer swimming, canoe and boat rentals, and fishing. Black Bass Lake City Park, a facility completed by the Eureka Springs Park and Recreation Commission offers trails encircling the lake (about a one mile loop) with access to a non-motorized boat launch, a picnic area, several fishing spots, two wooden bridges and about one and a half miles of hiking and bike riding, including about a half mile of handicap accessible trail. 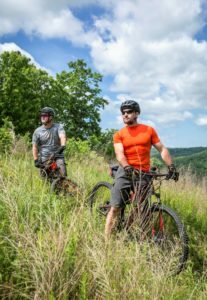 Home to some of the best mountain biking in Mid-America, Eureka Springs, AR and the OZ Trails system of Northwest Arkansas offer a huge variety of trails for mountain bikers of any experience level. 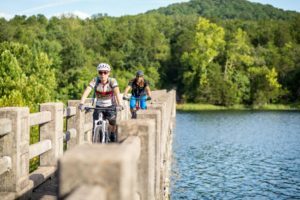 From beginners looking for a scenic ride through the breathtaking Ozark Mountains, to seasoned bikers looking for professionally developed routes, we’ve got it all! Cosmic Cavern was discovered in 1845, but wasn’t developed until 1927. The cave features a 9 foot soda straw – the longest known in the Ozarks, and two bottomless lakes. One of the lakes was discovered in 1993 in the “Silent Splendor” section which made national news. This was Arkansas’ most delicate discovery. 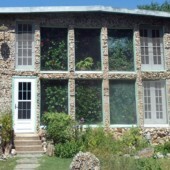 This is a guided 1 1/2 hour tour and is about a 20 minute drive from the inn. Take Cosmic Cavern and turn it on its side and you have War Eagle Cavern. Its rooms are large but not too tall (you can reach up and meet a stray bat up close, that’s if you want to of course.) This was the cavern where the movie Jesse James was filmed. When you’re done, consider visiting War Eagle Mill just a short ways down the road. Onyx Cave is the closest cave to Eureka Springs. It has a thirty minute radio headphone self-guided tour. While not as big as either Cosmic or War Eagle caverns, it offers a quick glimpse of what caves are all about. 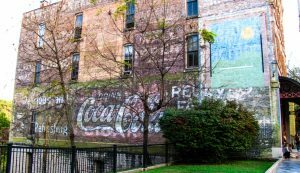 A few of our favorite restaurants here in Eureka Springs are listed below. Enjoy! Note: Many restaurants in town do not take reservations, but serve on a first come, first served basis. (Peak season and off-peak season hours may vary). Very good German-Czech food. Everything from sauerkraut soup to Sauerbraten, this place will certainly fill you up. Don’t forget to try their German Chocolate cake. Nice thick layers of coconut filling and then topped with a hard chocolate ganache. Eureka Springs’ newest restaurant serving brunch, lunch & dinner with emphasis on Vegetarian & Vegan offerings. Italian restaurant serving up delicious recipes made with love by Chef Katherine Zeller. Tom and I think the pizzas are fantastic and enjoy trying something new each time we visit. A must if you’re craving Italian! If you like trout, this is the place to go. Their trout dishes are fabulous. The DeVito family owns a trout farm only an hour from Eureka Springs so their trout is always fresh. Lots of choice Italian dishes can be found and they also have a lunch menu. One of the most recommended restaurants in Eureka Springs and one of our favorites also. It’s only three blocks from us, and we like the great tasting home-style Italian food. All their pastas are excellent, and they also cook a thick juicy pork chop dish. It’s a casual restaurant, and they do not take reservations. Located in an old log cabin, known for their steaks, prime rib and beef burgundy. If you don’t like steaks, no worry, the other half of their menu has a variety of items which will please your palate. If you’re here during the week, they also have some great specials. An upscale restaurant in a grand old hotel. The chef has created some exceptional dishes. We’ve tried several dishes from beef to seafood and have been pleased each time. Located in beautiful downtown Eureka Springs in a historic building that was built on solid rock with a continuously running spring, a wood fired grill and wine bar. Menu selections offered: chicken, beef and seafood. We’ve yet to find a plate we didn’t like! A fabulous new restaurant in Eureka Spring, located below the New Orleans Hotel downtown. Le Stick’s chef is constantly creating new dishes that are sure to please. We love their filet and cod dishes, but honestly we’ve never had any dishes we didn’t like. Exciting 7-8 course tasting events are offered throughout the year. Check them out the next time you are in town! A favorite of the locals in town. We have come to really enjoy Local Flavor and we always get rave reviews from our guests about this restaurant. Their menu has something for everyone. This restaurant is downstairs off of Main Street with a good variety of sandwiches, coffees and other lunch items. They have Trivial Pursuit cards on every table, so indulge yourself while waiting for lunch. If you’re looking for dessert, they have a whole case full of them. The “Little Sister” of Mud Street Cafe will delight you with its original tin ceiling, brick and limestone walls, and re purposed wood bar. Suspended over the stream that gave “Mud Street” its name, The Annex pays homage to the force which built Eureka Springs – its water. Where else can you eat breakfast and sip award-winning coffee while watching the water flow 20 feet below? Small in size, but big on flavor! Nibbles Eatery is a great place to enjoy lunch or coffee in the afternoon. We’ve had their quiche and several types of sandwiches. None have let us down. Located downtown at the top of Spring St. If you are looking for a great burger and rib joint, then try the Rockin’ Pig. We know barbeque is a personal taste, so when we say it’s the best barbeque around, you probably need to know our style is Texas style. The ribs are wet and smoky and fall off the bone. The burgers are top shelf. Also, try the Loaded Sweet Potato Fries, with white cheddar cheese, fresh BBQ pulled pork and drizzled with chipotle cream. A little bit of everything is served here. This is another place you’ll find the locals. Good burgers and some excellent specials. You can satisfy everyone’s food liking at Sparkys. Excellent Thai food and a huge menu to choose from. They also opened up a patio seating area for those who want to enjoy the outdoors while indulging in their spicy food.